One of the best parts of the haunting season is of course the food. 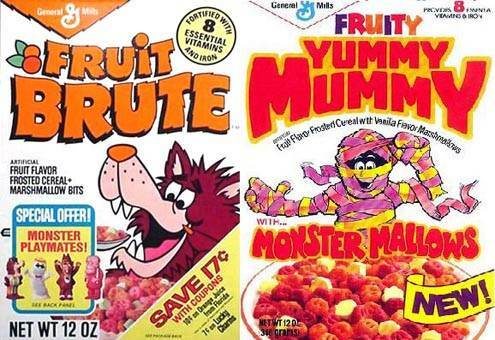 Candy in needlessly large bags for sale at every grocery store, little magazines with ‘spooky ideas’ for ‘creepy dinner parties’, the chance to grab a pumpkin without seeking out your weekly farmers market, and finally…the General Mills monsters. Let’s be honest, a vampire could never survive on chocolate. But chocolate cereal with milk that turns into chocolate milk when they’re combined? AND marshmallow bits? 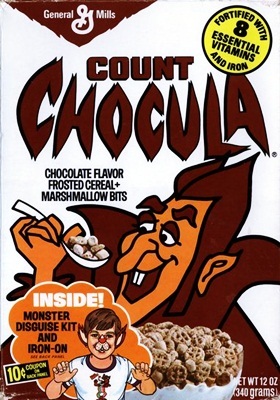 Apparently General Mills says this was the first chocolate cereal with chocolate marshmallows. Nothing really stands out about the flavor to me, but the box is always pretty cool. Much like the spirit of the Snozzberry, Franken-Berry tastes like Franken-Berry…if you really think about it. Franken is usually tacked onto anything brought back from the dead or re-animated. The flavoring is artificial…so it’s re-animated, isn’t it? Wow. Now that I think about it, this is the most honest food on the market. 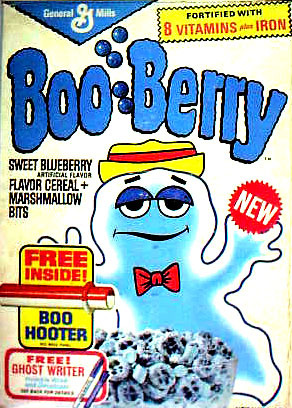 As a kid, I was never a huge fan of Franken-Berry, but you can’t really have an October without at least one bowl of this guy’s Franken-Fruit. Oh, hi Fruit Brute. Fruity Yummy Mummy. Yeah, nobody liked you. Sorry about that. Maybe because people don’t generally equate the word ‘brute’ with werewolf, or they don’t like the idea of fur in their cereal. I don’t suppose the fact that the Mummy’s name was too long had anything to do with it…Maybe it was the taste? I suspect it’s a combination, and the fact that they’re labelled with the simple flavor of ‘fruit’, a concept more terrifying than the monsters themselves. Who knows. These two disappeared long before I was around to judge them.